Very tasty cheese sticks and not only with beer. 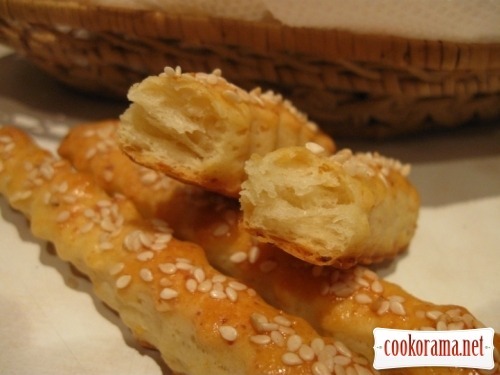 Recipe is from the book «Homemade pastries» V.О. Tsyganenko, О.І. Zdobnov, V.К. Seleznev. 1991 year. Mix yeast in a bowl, add sugar, one tablespoon of cream. Mix well and leave for some time. Add egg, cream, milk, salt, grated cheese and mix everything. 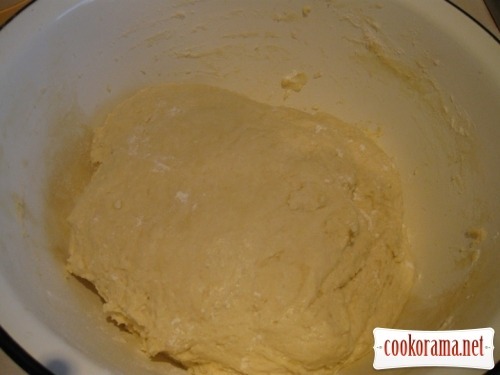 Add flour, knead the dough. At the end of kneading give melted and cooled margarine (I use less). Knead it again, so it won`t become sticky. Powder with flour, cover with a cloth and leave for 20-30 min. Part of the dough roll into 7-10 mm layer. Cut the edges of it to form rectangle, which is cut into strips of 1,5-2 cm width and length 10-15 cm. 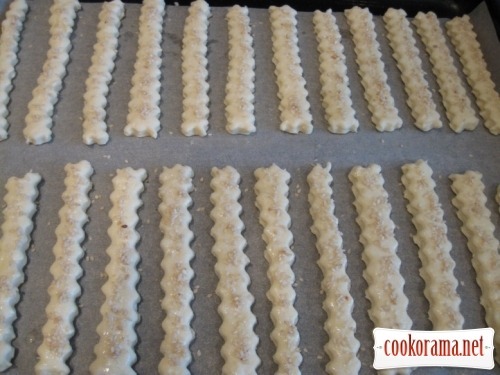 Put strips on a covered with a baking paper pan. 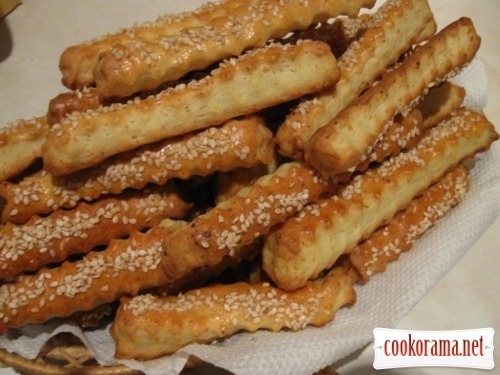 Grease them with egg and add grated cheese or sesame seeds. Bake in the oven at 180℃ till it become golden. Do the same with the other part of dough. 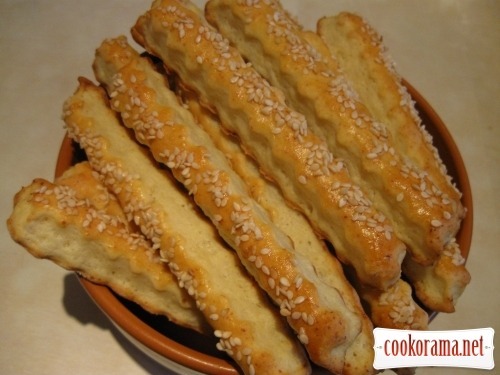 Top of recipe "Cheese sticks for beer"
Пива не п'ю, але паличку з'їла б з задоволенням. очень красивые палочки!!! а чем Вы тесто разрезали? не вийшло в мене вставити посилання, то пишу так. Я с кофейком бы не отказалась! Я також люблю з кавою, бо пиво, то не мій напій. А взагалі, деколи печу замість хліба до перших страв. Так, до перших страв мені теж таке смакує. Якщо посипати кунжутом, то його потрібно попередньо обсмажити. А просто підсушений не підійде?